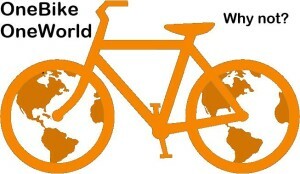 On the 27th of September 2011, TravellingTwo had a contest with Waterfield Designs. People commenting on their article, and re-tweeting a message would be entered into a contest to win a bag. I entered, and a week later was amazed to find that I had won! 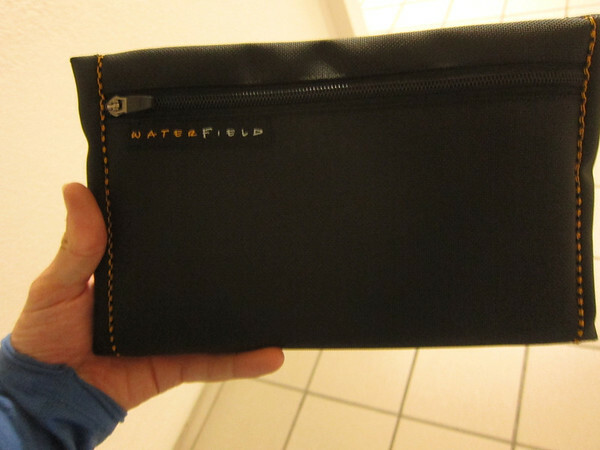 As fortune had it I was almost in San Francisco, so visited the Waterfield office to pick the bag up in person. 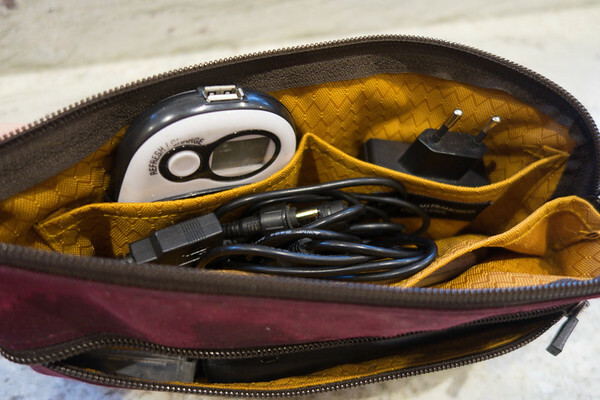 The transition from Ziploc to a professionally designed bag was impressive and I happily carried my small electronics around in the bag for a few years, until after five years of solid service the side seam failed in Turkey. When the bag failed, I sent an email to WaterField and Heidi got back to me inside 15 minutes – talk about customer service. 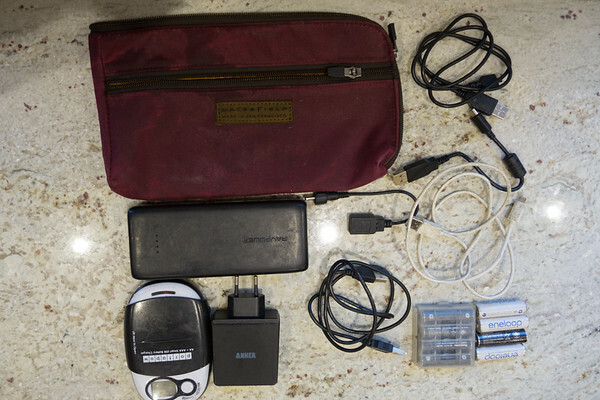 She confirmed that they’d not be able to repair it, but offered to send me their updated Gear Pouch to try out. I happily accepted and it winged it’s way over to me from San Francisco for the New Year. There have been a number of changes from the old Gear Pouch to this updated version. 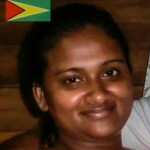 Firstly, is the choice of material. 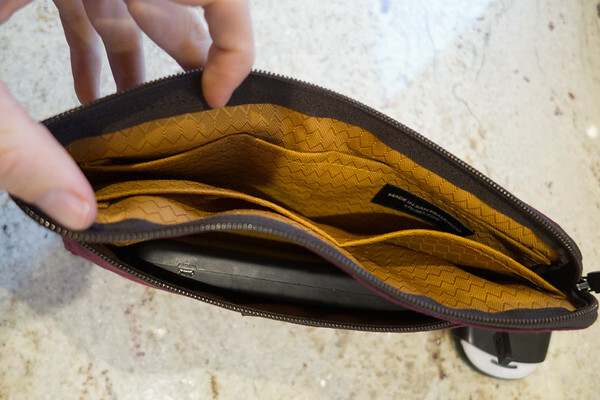 It was possible to get it in the same “Black Ballistic” option as my previous pouch, but also 3 waxed-canvas options in brown, burgundy and navy. Secondly, the design has been expanded to add more pockets. Before, it was basically one big pocket with zips on both side and a divider down the middle. 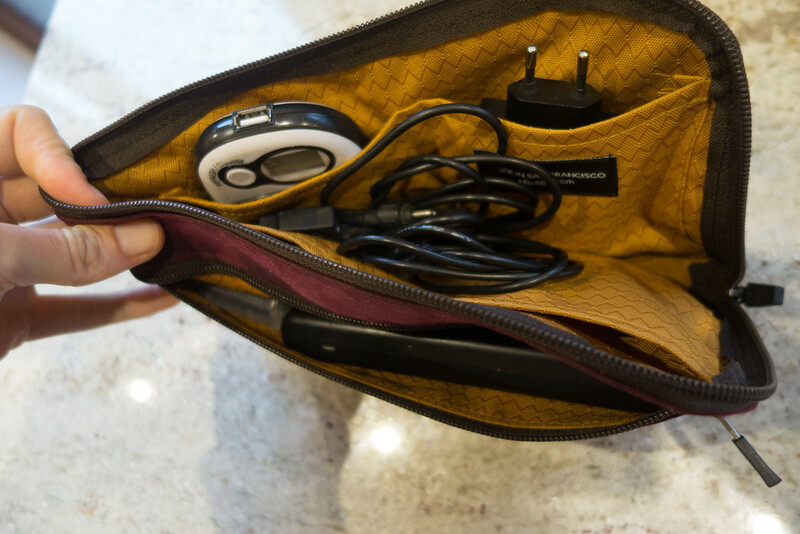 Now, it has an external pocket and 4 internal ones allowing things to be organised better. Trying the bag out, the first thing that I thought is that the new design (especially with the waxed canvas option) looks more professional than my previous bag. The one visual change that I’m less of a fan of is the new label. 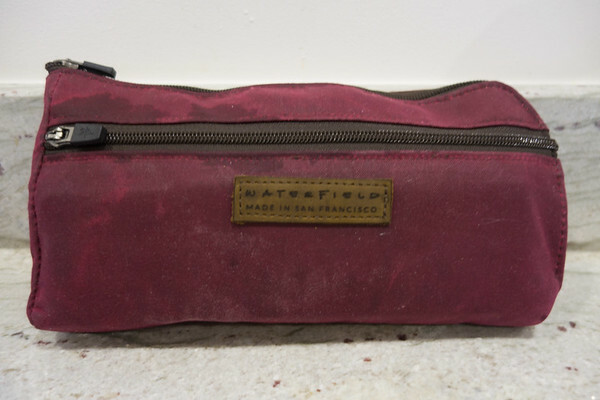 Previously there was as small label that said Waterfield on the front. This has now been replaced by a leather label positioned front and centre. It continues the professional look, but as a minimalist I prefer the smaller label on the previous design. Having said that, it’s a very minor thing. 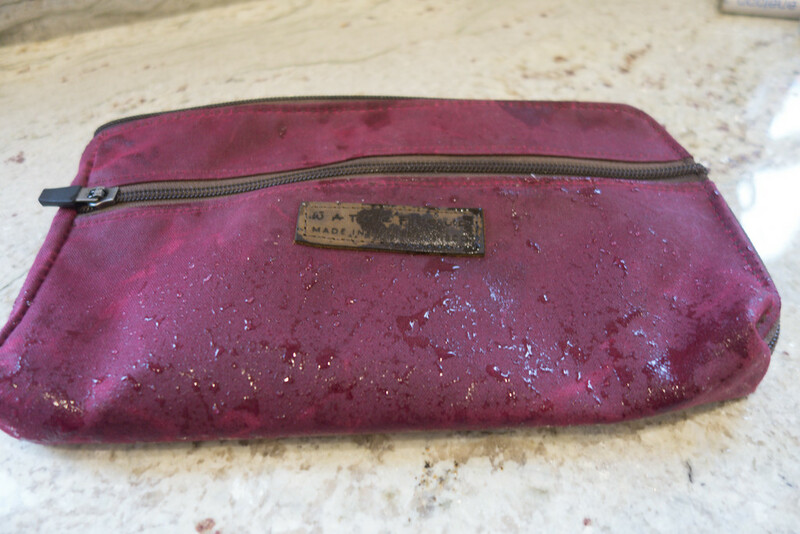 One of the aspects I really liked about the previous pouch was that the material was very spill resistant. You could run the bag under a tap, and no water would encroach. My new waxed canvas version retains this too, and the water even runs off better. 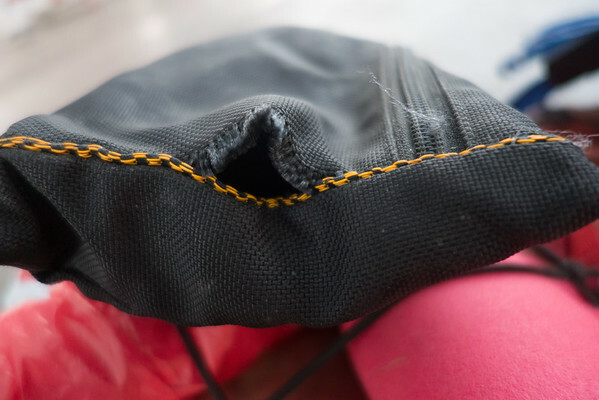 I repeated the ‘under-the-tap’ test, and nothing came in through the material, but the zips are not fully waterproof. Speaking of the zips, they are ‘locking zippers’, which basically means that if you fold them down they lock in place and won’t slide. It’s a nice touch and indicative of the quality that WaterField are aiming for. Once you open the zippers and look inside, you immediately see the gold liner. It’s soft and bright, much better than a dark colour which you could lose items against. Being gold, very few items are going to camouflage against it – or at least in my bag. There are 3 sizes offered (small, medium and large) and I opted for a medium. It’s marginally smaller than the large I had before, but seems to be about the right size for me. Inside I can store a USB plug, a 20,000mAh USB power bank, 8 AA batteries (for my GPS), a USB battery charger for the AAs and all my cables. As I’m at home, and not currently travelling, I’ve not got any on-the-road experience with it but I’m optimistic that it’ll work well. Overall my experience with WaterField has been fantastic. As I mentioned before, their customer service is supremely fast. Responding warmly in 15 minutes to an email is wonderful. My previous Gear Pouch lasted for 5 years of almost daily usage and sitting in a pannier before the stitching failed, showing high quality workmanship. I’d definitely recommend their products, and if I were looking for a new sleeve for my MacBook, I’d be looking at their other products too.